Stationary vise, stand alone clamp & Toolholder. 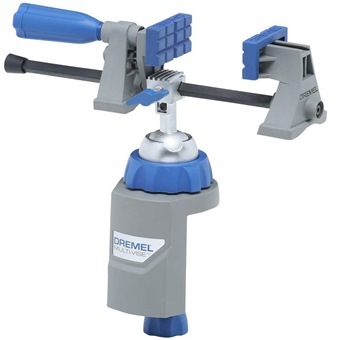 Clamps to any workbench, table or countertop Rotates 360° and tilts 50°. Allows approaching the workpiece from a comfortable angle. Jaws may be used with base unit or detached for use as a stand-alone bar clamp. Easily accommodates larger work pieces. Stabilises oversize objects and protect delicate pieces from damage. Allows round and odd-shaped objects to be held securely. Allows quick removal of objects from jaws. Resists twisting and bowing for solid stability.